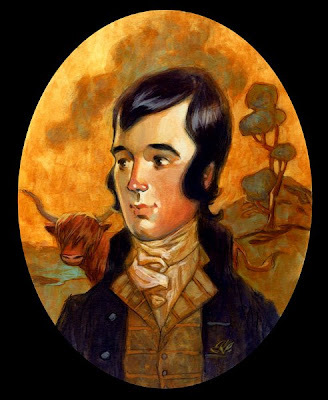 The Scottish poet Robert Burns. Sort of a caricature off of the few existing portraits I could find. My version makes him look a bit like a gangly teen. Was fun to scumble and glaze and chop in cloudy shapes. Every painting feels like it's a tiny step toward the next one. Maybe I'll try him again someday. I hope you do. This is good but, as you said, he came out looking a little young. i love this painting. It is so great to see your work again. Very nice rendering of the bard. I especially like the highland coo over his shoulder. And is that a haggis tree on the right? "And is that a haggis tree on the right?" Oh yeah, That does look like a haggis tree, but I think they only grow in swamps. *all of the above may be a complete lie that us Scots tell to American tourists, but you won't know for sure until you run around a mountain. Anyway, huzzah to you, Steve. The Bard has been my favourite poet ever since I read Tam O'Shanter. Ah. Robert Burns and his trust sidekick Ox-Parrot. So it turns out the lyric that most inspires Bob Dylan is one of Burns's: A Red, Red Rose. See the article in The Guardian. Some things are timeless.